The Kesh (unshorn hair) is regarded with the highest importance in the Sikh religion and is one of the basic requirements for a Sikh. Dishonouring one’s hair is a gross transgression and the offender Sikh is branded a patit “an apostate”. A Patit is no more a Sikh. So much so that a Sikh dyeing Kesh or beard is also declared a tankhahia, religious sinner and his offerings at Sri Akal Takhat or any other Takhat is not permitted. A Sikh doesn’t disfigure their hair from head to toe because of the Guru’s order to maintain the sanctity of the Kesh. Nothing else matters. A Sikh does what their Guru tells them to do. “O mother, True, True True is the Lord, and True, True, True is the Guru. The entity and the identity of a Sikh are interdependent. Though there is no doubt that merely by sporting unshorn hair a person will not become a Sikh, but it is also true that without Kes a person cannot be a Sikh. It is thus construed that every person keeping unshorn hair does not become a Sikh, but every Sikh is and ought to be Kesdhari (one who maintains unshorn hair). The foundation stone for keeping unshorn hair was laid by the first Guru itself. Guru Nanak categorically stated that it is essential for a person to keep unshorn hair as this is a blessing from God and doing away with it is a breach of trust and misappropriation. In fact, a Sikh by doing away with his kes breaks his relationship with Guru Nanak. The following are quotes from Makke di Gosht -Guru Nanak Sahib’s conversation with Muslim sages, which were held during his sojourn to Mecca. Every religion has its rules and regulations. It is imperative for a religious person to honour the sentiments, feelings and codes of every other religion. Guru Gobind Singh was asked by the royal peer, sage of emperor Bahadur Shah: “Which of the two religions is better, yours or mine” Guru ji’s reply was, “tum ko tumahara khoob, hum ko hamara khoob – for you, yours is wonderful and for me, mine is fine.” Hence it is abundantly clear that Sikh Rahit Maryada or Sikh Code of Conduct is to regulate the life, deeds, do’s and dont’s for a Sikh only. It does not interfere with any other religion or religious group and will not invite any intrusion by any one else. Kesh and the Keski (turban) that covers it are divine gifts from Creator Lord received through the Guru. Discarding these primary ‘articles of faith’ by a Sikh is a willful act of contempt against the will of God and Guru. Didaar, guftaar and kirdaar -appearance, conversation and the inner character, are the three parameters to judge and assess a person. The later two stages come in if the person does not falter at the first stage itself. The Sikh Rahit Maryada is a well codified text containing the do’s and don’ts for a Sikh. Contrary to common belief, the Sikh Rahit Maryada is not created by Shiromani Gurdwara Prabandhak Committee or SGPC. SGPC is its mere publisher and acted as a facilitator for its codification. In 1931, the SGPC, under the convenership of Professor Teja Singh, an authority on Sikhism, constituted a Sikh Rahu Reet Sub Committee. The Committee consisted of Jatehdars of all the Takhats, the Head Granthi of Sri Darbar Sahib, Amritsar (Golden Temple) and well recognized and respected Sikh scholars and prominent Sikhs of various seminaries and institutions who had made unparalleled contributions in the field of religion and service to the Panth. The draft Sikh Rahit Maryada prepared by this committee was widely circulated all over the world and views and suggestions were invited and considered. Finally, in 1945, the present form of the Sikh Rahit Maryada was approved and published. It is, thus, the collective wisdom of the entire Sikh Panth and contains the Sikh rules and regulations applicable on each and every Sikh. Guru Granth Sahib is the embodiment of the Ten Gurus but contains banee of six Guru Sahibs. Guru Gobind Singh’s banee is contained separately in Dasven Patshah ka Granth or Dasam Granth. Bhai Gurdas I was a contemporary of Guru Arjan Dev ji. Bhai Gurdas II was a contemporary of Guru Gobind Singh ji. Bhai Nand Lal, the renowned Persian scholar who served the Mughal Durbar, had left the Emperor’s service and came to stay at Anandpur Sahib, the camp headquarters of Guru Gobind Singh. Guru Gobind Singh valued his writings and gave recognition by giving the title to his works too. The special status of the writings of Bhai Gurdas I and II and Bhai Nand Lal can be ascertained from the fact that in Harimandir Sahib or any Gurdwara, besides Gurbanee, the hymns and compositions of these two scholars may be sung and recited. Bhai Nand Lal was dictated The Sikh Code of Conduct, known as Tankhahnama, was dictated by Guru Gobind Singh to Bhai Nand Lal and is an important source of the Sikh Rahit Maryada. The true divine sunnat (injunction) is the hair brought by birth. Blessed is the one who keeps the hair as a trust of God. Says Nanak, the hair is the blessing of the Lord to man which ought to be presented back. The man has to present himself in the court of Lord with this trust. The one who could not keep the hair intact has is in fact committed breach of trust and is to be regarded as faithless. Says Nanak to Pir Bahavdeen, both Hindus and Muslims by losing the hair in fact have lost head and have become sirgum. There is a principle (vidhaan) of maintaining Kesh. Meaning, those who have beautiful nose and beautiful Kesh, they too are your nose and Kesh. Thus, a Sikh should keep full appearance (i.e. maintain unshorn hair and not pierce the nose), crowned with a turban on the head. Meaning, braids, plaits, making partings with the hair and adding colour to the hair etc is prohibited for the Sikh of the Guru. Such people do not get accepted the Court of the Lord. There is one Salokh of Bhagat Kabeer Ji which is often misquoted by mischievous people trying to justify the un-Godly act of shaving or trimming their hair. This salok (couplet) clarifies the above salok. As well as having biological functions and benefits, the hair is sacred due to the fact that spiritual energy abides within each and every pore of hair on the body. The hairs are like electrical wires, which preserve, carry and vibrate energy. When one chants & meditates the Divine- Name (Naam), each hair vibrates. Sikhs do not forcibly or intentionally remove any hair from the body but maintain clean hair with proper washing; tying and keeping them covered are requirements for a Sikh. A youngster sacrifices his Kesh (his faith and honour) for the price of 10 rupees. Someone could argue why do Sikhs cut their nails when they don’t cut their hair. Firstly, nails and the importance of hair cannot be compared. The hair is sacred that have a spiritual importance whereas the nails merely have biological function. Secondly, nails naturally remain short as they are brittle and rigid as a result of which they break off easily. A Sikh is required to do seva (selfless service) with his or her hands. When a individual uses their hands to do selfless service of washing up dirty dishes, cleaning shoes, sweeping the floor, cooking and serving food then there is no possibility for nails to remain long. A Sikh lives in the grace and glory of God. The Kesh are magnificent. Biologically, physically and spiritually they do so much for us. 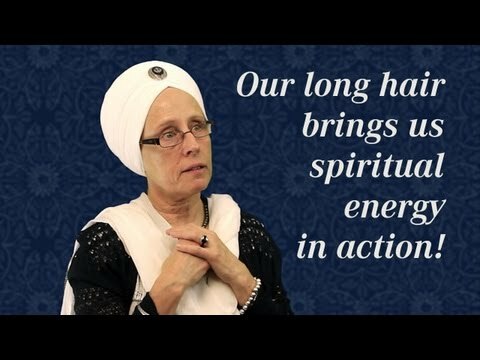 Looking at the Kesh of a Sikh one sees the Sikh principle of “Living in the Will (Bhaanaa) of the Almighty.” The Kesh is a symbol of Sikhism and what the fundamental belief of Sikhs. Bhai Taru Singh jee is a Shaheed (martyr) who is a living reminder of what the Kesh means to the Khalsa. When asked to give up his faith and denounce Sikhi, he preferred to have his scalp removed than cut and disfigure his Sacred Kesh. « What is the significance of the Sikh Turban? I have a question about hair. If there is a hormonal imbalance that causes a woman to have facial hair then is it OK for her to treat the facial hair? If not why because we get ourselves treated medically to take care of situations without body so if functions at its best. If we are to accept our bodies The way God made them then we would not need to have physicians to trade any illnesses. I feel that God would not put a woman in a situation where she is the center of attention because of a physical defect. Please do not say that it is easy for a woman to live with facial hair. Those that do have my utmost respect because it is difficult and they are strong women. The only other comment I have is the woman who find themselves in the situation should please take the medicine as prescribed by their doctors because unfortunately along with all the stuff or associated a lot of other diseases that can happen later in life. Thank you for taking the time and the patience with this comment and question.